The Oregon Ducks like being on the cutting edge. Taking advantage of Nike CEO Phil Knight’s generosity to his alma matter, Oregon has received the finest the sporting giant has to offer. But unlike the football jerseys that can be ugly, really ugly, or God-awful, everyone will be able to agree that the new locker room that Knight had built for the team is incredible. This is the kind of thing that would have the folks at Disney drooling and the crews of MTV Cribs (that’s still a show, right?) on the next flight to Eugene. Back in my catholic school basketball days, we couldn’t get out of the tenements they called a locker room fast enough after games. With a marvel like that, I’d never want to leave. College teams are always looking to find ways to one-up each other to find recruits. As a high schooler, I’d have a tough time going to play somewhere other than Autzen Stadium if Oregon came calling. This isn’t the end, however, as I’m sure other teams will be trying to get donors to get money to build the next modern marvel of a dressing room. All I have to say is bring it on. Let the locker room wars begin. Hearing the news of Todd Graham leaving Pitt for Arizona State floored me. It seemed that after a 6-6 season in the Big East, Graham seemed like one of last people that would be moving out. In typical Pittsburgh fashion, the media firestorm ensued. After taking the day to soak it all in, here is what I’ve taken out of it. 1. 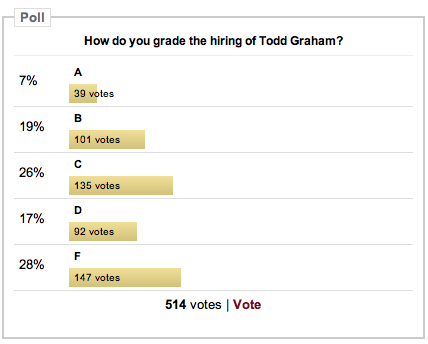 Todd Graham has every right to leave when he wants. Let’s be real here. It certainly is easy to say what a horrible person Graham is for bolting out on Pitt for Arizona State, but if we are in his shoes, do we stay put? Todd Graham wanted his family and himself to be happy. If that means going for more money and living in a place with better weather, so be it. I know I would not stay in a place where I was unhappy when a arrangement that means more happiness for me and my family could be made (mainly $$$). It may upset others, but I would still do it. It is 21st century college football and I’ve grown to accept it. On the other hand…. 2. There is no excuse for the way Todd Graham left. My parents always tell me how much people don’t know how to communicate face-to-face in the 21st century. Texting and social media, in their opinion, has ruined our ability to talk with one another. I always thought they were crazy, until now. What in the world was Todd Graham thinking? It’s one thing to leave a team, it’s another to completely abandon them. 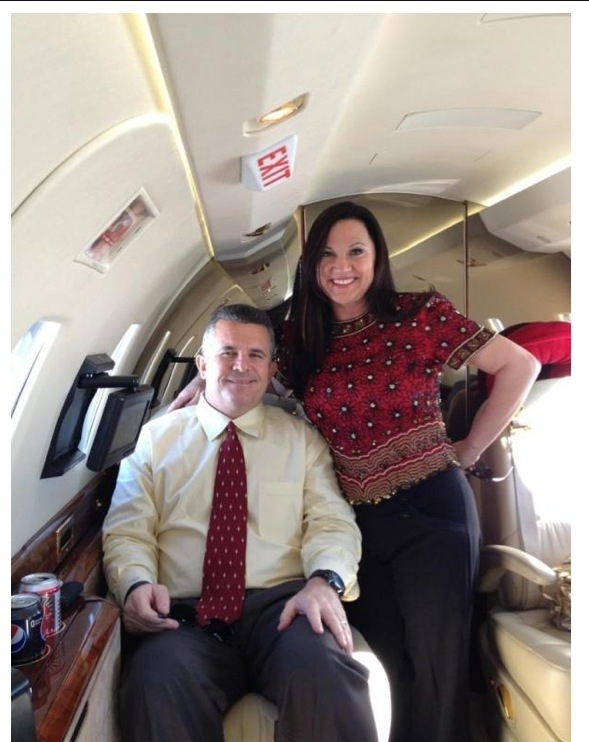 Then his wife Penni had the audacity to post this picture to Twitter of the two of them on a private jet to Tempe. Graham is outfitted in ASU colors. It is as if they are mocking the Pitt program. Could he really not work up the courage to look his players in the eyes and tell them he was moving on? He never had a problem keeping quiet when criticizing players or hyping up his failure of an offense. Why the silence now? I’m not buying his excuse of it being a time issue. Arizona State wasn’t going to give the job to someone else in the hour it would have taken to address the team. That’s what really upsets me. I don’t know how many chances someone in a powerful position such as athletic director of a BCS school should get. My hunch is it should be less than the number Pitt AD Steve Pederson has received. After botching coaching hirings at Nebraska, it should be no surprise that he has now twice hired men of questionable character in less than a year to lead the football team. When Pitt takes the field for the BBVA Compass Bowl under interim head coach Keith Patterson, that will make it five different head coaches in roughly 13 months for the program. Someone should have to take responsibility for it, and Pederson should be gone. 4. The players have every right to be mad. The backlash from players has been strong. None have been more vocal than wide receiver Devin Street. I never played a day of organized football, but after being on the beat of a D-I college football team for a year, I can tell you there are few relationships in sports that compare to the one between football coaches and players. The athletes, who come from different backgrounds, connect with what the coaches are saying, not only on the field but off of it as well. To have a coach leave like this must be a horrible feeling. With all of the turmoil at Pitt in the past year, you can see that each incident brings this group together more. Though they are far from being the most talented college football team, they have certainly dealt with a lot of adversity which makes them a stronger group. 5. 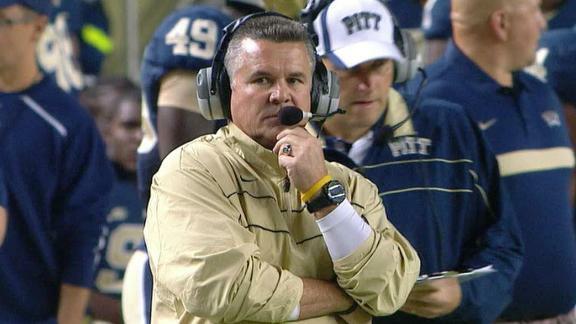 This will hurt Arizona State more than it will hurt Pitt. I don’t know what the ASU Sun Devils are thinking getting a coach that just came off of a 6-6 season in the weakest conference the BCS has ever seen. The reaction has not been good on the SB Nation ASU blog House of Sparky. Reports are that many former ASU players and alums are upset with the hiring, as a pattern of unloyalty has really become exposed for Graham. With the news of his departures spreading across the nation, recruits will know about his ways, and will basically know he is lying to their faces. Pitt may lose some recruits with another coaching upheaval, but they still have their reputation. That’s what matters when getting players. It will be interesting to see what happens next, as what was looking to be another quiet off-season for Pitt Football has been turned upside down. While you are browsing for the latest rumors, make sure you check out Graham’s introduction press conference HERE. The vicious cycle has begun yet again. Graham will make his debut as Arizona State coach on December 22 in the Las Vegas Bowl. It will be safe to say that a good portion of Western Pennsylvania will be trading their blue and gold for blue and orange that night. The ticking time bomb that is college athletics came closer to a full explosion when it was announced that Pitt and Syracuse would be leaving the Big East for the ACC. It was a surprising move, given that the brass at Pitt made it seem like the school would be reactive rather than proactive. I suppose that after the first domino fell (Texas A&M to the SEC) they felt the timing was right. There are both pros and cons to the decision. Let’s take a look at them. With the lack of depth that the Big East has for football, the program should get a boost from making the jump to the ACC. There will be more money to be had from bowl games and good seasons will be rewarded with better than the Meinike Car Care Bowl. Although the Big East has cemented its place as a power in college basketball, the ACC should give the Panthers a chance to show their stuff against perennial powers such as Duke and North Carolina yearly. It will be very exciting to have those teams coming to Pittsburgh regularly. The move in the conference will also rekindle old rivalries with Miami, Boston College and Virginia Tech who left the Big East in 2004 or 2005. Pitt had many great match ups with these teams in football in the late ’90s and early 2000s’. It could potentially wake up a very dormant fan base and get them out to Heinz Field for games. Although the conference features Duke and UNC for basketball and Florida State and Virginia Tech for football, there is a lot of dead weight in the conference. Teams such as Wake Forrest, Georgia Tech, Virginia, and NC State to name a few struggle to compete consistently. The conference lacks depth, especially in basketball as the others just can’t keep up. There are still many moves to come in conference realignment. Many schools have been rumored to move including some ACC ones. Once the dust settles, there is a chance that Pitt could still find themselves in an inferior conference compared to the rest of the country. End of the Backyard Brawl? Since Pitt has bolted, they will no longer have a mandatory game with West Virginia. Although it wouldn’t be tough to schedule the matchup out of conference in basketball, it may be a sticky situation for football. It is often the highlight of the season for both teams so the inability to play it every year will be a tad disappointing. I can’t really come up with a final verdict on whether the move is good or bad since there is still so much that could happen with the rest of the conferences. Only time will tell. I still applaud the schools proactive approach to realignment as they are moving on their terms rather than doing so because they had to.